We are surrounded by models. When you check the weather forecast in the morning before going to work, you are seeing the result of a model of your local atmosphere. This model is a set of rules and data manipulations built according to past observations of the weather, and refined over many years of testing and evaluation of predictions against actual results. By running current data—like temperature, pressure, humidity, and wind from a variety of locations collected over the past few days or weeks—through this model, you get a resulting prediction about whether it’s going to rain that afternoon. But models aren’t only good for trying to predict the future. By using them to predict the past, they can become powerful mechanisms for reasoning about history. 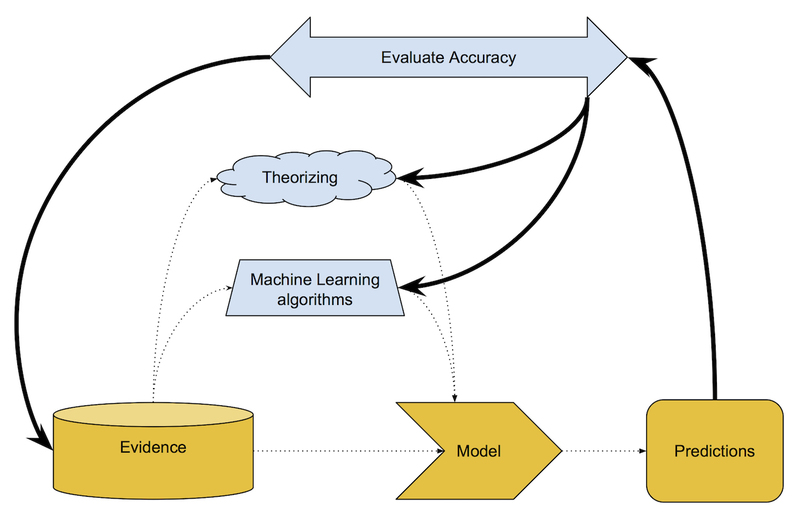 In this post, I’ll be introducing some modeling approaches (some aided by machine learning) that historians at the Getty and elsewhere are using to grapple with the past. The sociologist Joshua Epstein once wrote that we are all modelers already(2). Anyone who suggests what might happen in the future based on what happened in the past holds a model—however informal—of the world in their head. These mental models are replete with rules and assumptions that chart the course between some set of evidence or past observations, and some prediction for the future. Thus, Epstein argues, the choice for scholars isn’t whether or not to model, but whether or not to do so explicitly by specifying our starting premises along with the rules—whether defined mathematically, or in code—that lead from that starting evidence to our final conclusions. Among other benefits, Epstein shows that explicit model buildings help us form better explanations, discover new questions, and highlight uncertainties and unknowns. While Epstein was talking about modeling in the context of the social sciences, many historians are beginning to think (once again) about the intersections between modeling and historical thinking and argumentation. Historians create theories to explain the processes that may have produced evidence—whether archeological remains, archival documents, or even works of art—that survives today. This content was selected for Digital Humanities Now by Editor-in-Chief Laura Crossley based on nominations by Editors-at-Large: Brian Ganter, Isabella Calabretta, Mark Wartenberg, Bissan Rafe Duz.